The Deer Valley Rock Art Center, a 47-acre nature preserve that contains more than 1,500 petroglyphs, merges past, present and future. Managed by Arizona State University's Department of Anthropology, the center features petroglyphs left on more than 500 boulders throughout the Hedgpeth Hills, a sacred Indian site. In the visitor's center, designed by famed Southwest architect Will Bruder, interpretive displays examine the process of petroglyph production, preservation and interpretation. The Glyph Shop offers a variety of items relating to rock art including books, clothing and jewelry. The site opened to the public in 1994 and is listed on the National Register of Historic Places. Guided tours along the quarter-mile trail are available for school and adult groups or visitors may stroll along on their own. The Desert Botanical Garden offers the finest collection of desert plants from around the world in a unique outdoor setting. The garden has more than 50,000 plants on display throughout five thematic trails, which illustrate topics such as conservation, desert living, plants and people of the Sonoran Desert, and desert wildflowers. The garden offers lectures and workshops on desert landscaping and horticulture, nature art and photography, botanical art and illustration, health and wellness, and natural history. In addition, the garden offers specialized tours, concerts, special events, seasonal exhibits, an outdoor cafe, a gift and plant shop, and many activities for children and their families. This museum showcases the cultures and arts of Native Americans and the Southwest. Known for innovative programming and unique exhibits, the facility's displays range from hands-on activities to fine art. Native American artists daily demonstrate weaving, carving, sculpting or bead working. The museum also is known for its world-famous collection of kachina dolls. 22 E. Monte Vista Rd. This $19 million, two-stage, professional theater complex is home to Arizona Theatre Company, Actors Theatre of Phoenix, Arizona Jewish Theatre Company and other performing groups. Center Stage, the larger of the two theaters, seats 815 and has seating on three levels Acoustical properties are superior and were specifically designed for the spoken word so that both drama and musical theater are served well. Stage West seats 325 and is an intimate and flexible space for smaller performances. This park is home to the 127,000-square-foot Arizona Science Center and the 20,000-square-foot Phoenix Museum of History. The Victorian style Rosson House is the centerpiece of Heritage Square, Phoenix’s original town site. Monroe St. between 5th and 7th sts. 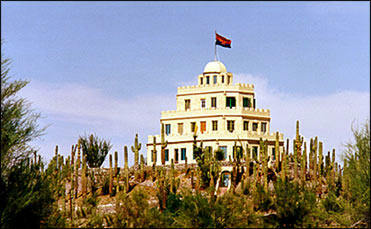 Situated next to South Mountain, this castle features 18 rooms and 13 fireplaces, and is furnished with Southwestern antiques. Built in 1929 and listed on the National Register of Historic Places, the Oprheum recently underwent an eight-year, $11.4 million renovation. The theater was transformed into a technically modern, but architecturally and historically preserved, venue for performing arts. The 1,400-seat Orpheum can accommodate local, regional, and national touring productions, performance companies, and nonprofit performing arts groups. With rolling desert hills and rugged mountains, this park is a favorite hiking spot where an easy trail leads to the hole—a large window with a view of the desert and surrounding city. Galvin Pkwy. and Van Buren St. Considered the Southwest's premier visual arts institution, this museum recently completed a major expansion project. The museum features painting, sculpture, and photography, as well as fashion design and decorative objects dating from the 14th century to today. Its collection includes significant Western American, American, Spanish, Colonial, European, Asian and 20th-century art, as well as costumes and the famous Thorne Miniature Rooms of historic interiors. Its touring exhibits have included a variety of genres, from ancient Egyptian to French impressionism. Central Ave. and McDowell Rd. Home of the Phoenix Symphony, Arizona Opera, and Ballet Arizona, beautiful Symphony Hall also hosts theatrical and musical performances from some of the biggest names in show business, as well as events on its outdoor plaza. The Phoenix Zoo is the nation's largest privately owned nonprofit zoological park. The zoo is home to more than 1,300 animals, including 150 endangered or threatened bird, mammal, and reptile species from around the world. 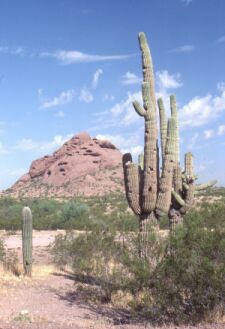 Plants and animals native to the Southwest are showcased on the Arizona Trail. Other attractions include Harmony Farm, giving children a chance to experience agriculture, and the Forest of Uco, a trip through a rain forest to see spectacled bears. One of the city's most popular hiking areas, the 1.2-mile summit trail offers spectacular views of the entire metro area. 2701 E. Piestewa Peak Pkwy. Pueblo Grande is the only National Historic Landmark in the city. The park includes an actual Hohokam ruin and an on-site museum featuring exhibits of the Hohokam and other cultures of the Southwest. Founded in 1881, St. Mary’s is still an active Roman Catholic church where Mass is said daily. A prominent landmark in downtown Phoenix, the church is noted for its carillon tower and magnificent stained glass windows. Near the base of Camelback Mountain is the Shemer Art Center and Museum, a reminder of the early days of Phoenix. Built between 1919 and 1928, the Santa Fe mission-style residence has become a family cultural center offering classes, special events, and art exhibits showcasing Arizona and the work of nationally known artists. Also on display is the Howard House, a miniature replica of an 1890 Colonial mansion. As the worlds largest municipal park, South Mountain's 16,500 acres feature city views, hiking trails, petroglyphs, and 300 specimens of plant life and a wide variety of fauna, including rabbits, foxes, coyotes, snakes, lizards, and birds. For those who would rather drive than hike, the road to the summit provides views of the entire city. As the nation’s first barrier-free park, this area has two "beep" baseball fields for the visually impaired, a therapeutic heated pool, wheelchair-accessible playground equipment, and programs for people with disabilities. The park, which was built by volunteers on land donated by the city of Phoenix, was funded entirely through donations. Sitting atop a cactus-covered hill, this birthday-cake-like castle is easily one of Phoenix's most recognizable landmarks, especially since it can be seen on approach to Sky Harbor International Airport. Tovrea Castle was built in the early 1900s by Italian immigrant Alessio Carraro as a grand hotel; it reflects the rustic elegance of the time. The Castle was later purchased by cattle baron Edward Tovrea. Now owned by the city of Phoenix, it is currently undergoing restoration and is not open to the public. 5041 E. Van Buren St. Dominating the crest of a 100-foot hill and presiding over the magnificent neighborhoods of the Biltmore area sits the elegant Wrigley Mansion. 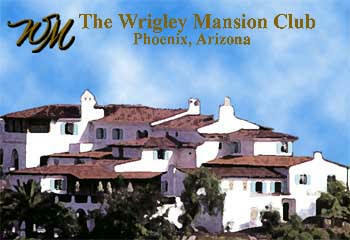 Completed in 1931, the mansion was built by chewing gum magnate William Wrigley Jr. Currently, the mansion operates as a private club. Public tours are available.